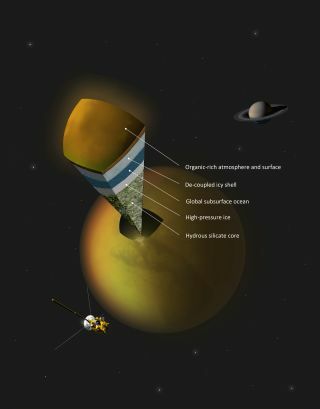 This diagram shows Saturn's largest moon Titan using data from gravity measurements by NASA's Cassini probe, which suggest an underground water ocean exists on the satellite. Image released June 28, 2012. The best evidence yet for a liquid ocean buried under the surface of Saturn's moon Titan has been found, scientists report. New observations show that Titan warps during the gravitational tides it experiences, suggesting an ocean sloshes under its outer shell. This ocean has long been theorized but never confirmed. Titan is the biggest of the more than 60 known moons orbiting Saturn, and is larger than the planet Mercury. Scientists have long suspected that an ocean might lurk under Titan's surface, as well as under Jupiter's moons Ganymede, Callisto and Europa. Previous observations have shown that the entire surface of Titan appears to be sliding around like cheese over tomato sauce on a pizza. "Liquid water elsewhere in the solar system is one of the main goals of planetary exploration for NASA," said study lead author Luciano Iess, a planetary geodesist at Università La Sapienza in Rome. "This discovery points to the fact that many satellites in the outer solar system hide large amounts of liquid water." To get a glimpse into Titan's mysterious interior, scientists relied on NASA's Cassini spacecraft, which has orbited Saturn since 2004. They focused on the extraordinarily powerful tides the planet's gravitational pull causes its moons to experience — tides ferocious enough to have once ripped apart titanic chunks of ice to produce the world's rings. Titan itself faces tidal effects up to 400 times greater than our moon's draw on Earth. By monitoring how Cassini's acceleration changed during six close flybys past Titan between 2006 and 2011, the researchers deduced the strength of the moon's gravity field. Since a body's gravity stems from its mass, these details helped reveal how matter is distributed within Titan and how this changed depending on how near or far the moon was from Saturn during its oval-shaped 16-day orbit around the planet. The strong way in which Titan deformed in response to Saturn hints that the moon has quite a flexible interior. This adds evidence to suggestions that an ocean lies concealed beneath a relatively thin shell 60 miles (100 kilometers) or less thick. "An ocean inside Titan was expected, but it was a matter of speculation — these measurements now essentially tell you for sure there is a subsurface ocean," Iess told SPACE.com. It remains uncertain just how deep this ocean might be. "We cannot say if it is 10 kilometers (6 miles) or 100 kilometers (60 miles) or more," Iess said. "We only know that there is a liquid layer." These hidden seas might be seasoned with the chemical ingredients of life, just as Titan's surface and atmosphere are. "Our measurements do not say anything about the existence of life on Titan, but there is a large inventory of organic molecules there, and there is water, so there are all the ingredients that may lead to life," Iess said. Future analysis of Titan's tides could reveal more about the moon's history, Iess said, such as why its orbit is so oval-shaped — whether its orbit began that way, or was due to a cosmic impact with another body. The scientists detailed their findings online today (June 28) in the journal Science.